The pilot of the small plane in which Emiliano Sala was traveling had admitted to being "somewhat rusty"
The Police of Guernsey keeps on Wednesday the search of the small plane in which the Argentine soccer player Emiliano Sala traveled, that in this market of winter signings had been transferred from French Nantes to Cardiff City of the Premier League and that disappeared last Monday at some point of the English Channel . The search tasks are centered today in the areas of Burhou, Casquets, Alderney, the north coast of the peninsula of Cherbourg, the north coast of Jersey and Sark. The last of the news before the resumption of the search was the publication of the name of the pilot of the small plane that was transporting to Sala: David Ibbotson , 60 years old and originally from the north of England, who in the first instance was not going to be the one in charge to fly the plane, but as it has been known, some last minute changes will end with him on board. In a message to some friends on his Facebook profile, Ibbotson had acknowledged days before the accident that he was " somewhat rusty " with the instrumental landing system, called ILS. The pilot, like the rest of the passengers on the plane, are still missing and, although the police still have several hypotheses, they recognize that the hopes of finding them alive are "scarce". 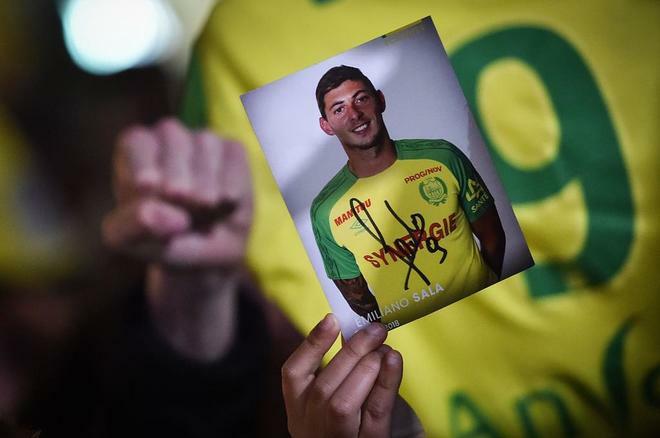 After the spontaneous rallies near the Cardiff stadium in Wales and in the center of the French city of Nantes, a tribute to Sala will be paid on Thursday at the Nantes club training center , where flowers and messages are piled up. of followers. On Wednesday a large-format portrait of the player was installed, with a smiling gesture, and the training on Thursday will be open to the public to offer "a moment to share" the fans. A similar portrait will be displayed at the Beaujoire Stadium and an online guestbook will be enabled on the FC Nantes website to leave messages for Sala. In Progreso , the small Argentine city where he lived until he was 16 years old , everyone knows "Emi" and his family. "He is a humble , generous person , who has a mental strength beyond the ordinary," said Martin Molteri, Sala's friend since they played together as children and still wants to believe in a miracle.
" It will appear soon and it will be fine, " he said, although the hope of finding the Italo-Argentine striker and the pilot of the small plane alive seems to have dissipated.